GraftinGardeners is a company of professionals and specialises in all aspects of tree surgery for both residential and commercial purposes. We are fully insured and equipped to undertake the most complex tree surgery works and can supply all your arboricultural requirements. We have five teams of tree surgeons and groundsmen, ready to tackle the largest of jobs. All team members have NPTC qualifications and certificates for climbing, chainsaw operations and aerial rescue. All tree surgery is performed to BS3998 standards, ensuring all cuts made are clean and precise, leaving you with well-balanced and healthy trees. Give us a call today and we will provide you with a free no obligation quotation. 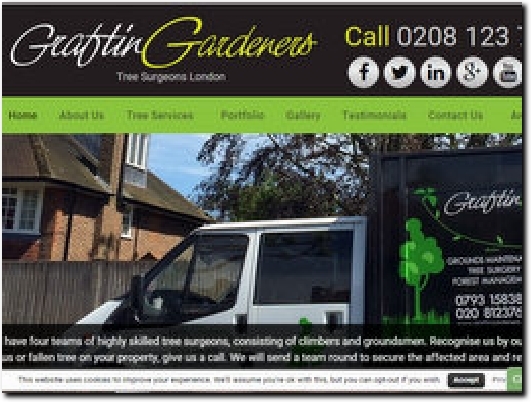 Family-run business based in south-west London offering tree surgery services. All staff have the relevant qualifications to perform a wide range of tasks. Testimonials available on the site. Contact Us has a quote form to complete and phone numbers. The business address and phone numbers can be found at the foot of each page, along with the Company Registration number and VAT number.